Today’s WEB EXCLUSIVE comes from CEC Combustion Services Group. For more information on the company’s services, visit this link. accidents according to the US Department of Transportation’s Office of Pipeline Safety. Luckily, a method was discovered back in 1824 that halts this process. Enter the birth of cathodic protection. Cathodic protection is the process of negatively charging the underground fuel piping (called a cathode) and positively charging a sacrificial metal, called the anode, to complete the circuit. Oxidation or corrosion will occur in the anode rather than the pipe, therefore maintaining its integrity. This is the most common type of protection and used by most facilities having natural gas or oil distribution piping. End of story, right? Wrong. Eventually the sacrificial metal will be depleted leaving your piping vulnerable to major damage. That is why you must have your cathodic protection system tested to monitor the rate of depletion. You are not alone, as the local utility must ensure its main supply up to the discharge flange of the meter is properly protected. This is required to be performed by the National Association of Regulatory Utility Commissioners (NARUC) once a year, but did you know that many utility companies are years behind with these tests? Your responsibility for fuel distribution piping starts with the discharge flange of the utility’s meter? 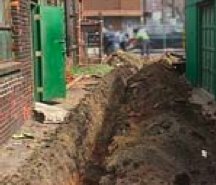 This means that the piping from the meter that goes back underground, maybe through the parking lot, is your responsibility to repair if it is leaking. In some cases, the facility’s main fuel supply must be shut off at the street bringing the plant down while repair crews work around the clock to get you up and running again. The National Fire Protection Association (NFPA) has developed the NFPA 54 (also known as the National Fuel Gas Code) for the proper operation, service and maintenance gas distribution piping. So what can you do? For starters, make sure the utility company is checking the integrity of its natural gas piping cathodic protection. CEC has drafted a template of a letter that you may download and customize for your facility to let the utility company know that this testing should be done and you would like to see proof that it has occurred. Replacing damaged piping can be expensive and time consuming. • Evaluate natural gas piping, especially uncoated (bare) steel pipe. Isolation and pressure testing, if needed. • Ask around to see if there are any service records from plant personnel or third-party firms. If this list seems daunting, there are third-party firms that professionally test and validate the integrity of the underground piping network. There are many gas odor signals that un-noticed or documented. Are there any fluctuations in gas supply pressures or are your combustion systems experiencing pressure excursions that are tripping the gas pressure switches? Make sure plant personnel have a reporting mechanism for stray odors. Mother Nature is also a resource. Many times leaks are detected as someone notices dead grass, melting snow, or bubbles coming up from the ground after a rain storm. You also want to make sure that no one tampers with the cathodic protection. You may see wires above ground that are attached to the underground pipe, but DO NOT SNIP THEM! That is the connection for testing. Don’t let your facility be susceptible to lost production, unscheduled downtime, or even lost fuel dollars because your cathodic protection is not working or has not been tested. For question or comments about this article, contact Justin Kowallek or Dale P. Smith at 216-749-2992. Next articleServices & Maintenance: Have You Checked Your PMP Lately?